This website investigates the testing prophecies-predictions of Michel de Nostredame. As with many forms of analysis we may be left with options and try to court the most worthwhile of these. This is not the same as striking a deal or picking the winner but the same urge to go with what feels most right is surely a motivating decider. This could be an emotional response (heaven forbid! said the scientist, irritably) or an intuitive one (having separated out insight from ego). Outside of the cogwheels of mathematics, as taught, there is never a perfect solution only the one best guess. As with everything some people are better at this than others. Nothing on these pages is thoughtless (bar some digi-mechanical mis-uploads and human errors) and each matter has been weighed – with a little bias, perhaps, toward what ever may open more doors for future research, mine and others. On the face of things this renders my aim a little hopeless but like the alchemist’s attempt to turn base metal into precious bullion it is well worth the trying for reasons of interest and enlightenment. I have written also about history in the making (the Articles ‘Watch Out World’ parts 1 – 10) which I had hoped might aid the uncrowned king recognized by Nostradamus who may well emerge – should such a person break surface at all – more or less contemporaneously with the choreographed moves toward globalization. As informed as they may have been at the time of writing, most of my leads and hints were then played out ‘on tilt’ because of the unexpected machinations of sly and stealthy geopolitical giants so proving that I am no new Nostradamus. As interpretive snapshots in history those pages are still pretty valid and yet, really, history does not occur in a linear manner yet nevertheless is compiled from the general conclusions for the end of each day. These are drawn from countless individual decisions for untold subjective reasons and then strung together to make a coolly collective story of dubious truth and imagined impartiality. In contradistinction, Michel de Nostredame sometimes expounds some deeply ‘insider’ stories. Today I feel that the social pendulum continues to make its swing back towards freedom and fairness with an increasing strength but please be warned: the one-world wolves – wrapped in science-fantastical sheep’s clothing and devastating lives by stealth so far – may struggle now to make time stand still for them by ruthlessly taking you back to feudalism’s collective serfdom, their biddable peasantry, and in death-dealing numbers. The one method is not at all by commanding others but to get a grip on our own self and go inward to find the rock we really are and not the one created by life’s circumstances, buffeted by winds and waves into self-delusion. Enlightenment and individual humanity will spring from that. It has been said that with the passage of the centuries even one’s own land must seem like a foreign country to the historian or time traveller. (The far flung translated as the farfetched.) How could a Sixteenth Century provincial physician, albeit quite well-travelled, look into future worlds and comprehend them so much better than, say, the typical tourist passing through? How did he know whatever intrigue he was witnessing? Many travellers routinely cross foreign lands without registering much depth of truth about them – and how could they if they possess no terms of reference nor any feeling for that alien culture, let alone some degree of savvy based upon in-depth experiences gained over time within that environment? The commonest mistake we make as we travel is to believe that we understand what we are looking at by basing our assessments upon the ways of our own culture. In my Western birthplace a boy and girl snatching a kiss in public is either distasteful or delightful according to to the bystander but in any event it looks mostly innocent and romantic. In parts of the East it could only be a green-gilled young braggart announcing to his friends some mistaken sense of possession over a streetwalker for no normal couple would show any such physical congruence or congress in public. How well does this ‘Opera Nostradamus’ understand the other worlds that it portrays – some of which have gone through major revolutions and social upheavals that are of necessity beyond Michel de Nostredame’s own life experiences? Does any one of us alive today fully understand the current technological age? Apparently no single human being knows exactly how the Internet works! Nobody knows for sure what electricity really is, let alone gravity, and both can catch us down in an unguarded moment. Science is slack-jawed about so-called Dark Matter and falsely names its correlative Dark Energy yet together they must make up most of the Universe according to the regulations currently governing physics. Both sides of the Twenty First Century’s fomented wars are frequently financed from very closely related war funds but nobody tells us that. News is forever puffed like a soufflé and bad social behaviours are urged upon us including below the belt. Yet any ‘novel ideas’ which appear organically from freedom of speech and freedom of thought are being edited and surely suppressed in this Age of the Corporation (including carbo-nations and cola-nisations) and their counter-culture cast-iron copyrights. Did Nostredame foresee all these changes cogently or are we imprinting our own dim understanding onto a waiting canvas of skitter-skatter word plays which is in itself his most brilliant strategy? Well I do not favour that particular interpretation especially but I would like to cast this among many other questions, including fresh ingredients for some others to bring, into the Nostradamus pot that ever simmers. Though substantially heavier than many money-making Nostradamus websites still I find my own somewhat ‘lite’ when measured against the potential depth of predictive truth I feel sure is yet to be found within the ‘Opera Nostradamus’. Superficial certainty over any complex subject – feeling comfortable over knocking loudly on the most obvious door – is more of a personal pacifier, rooted in reassuring illusions, than a sign of shining clarity. Justice comes from revelations that truthfully unravel interrelated stories so as to reform the whole view. Divining the seeds and revealing the isomorphisms is necessarily a tiered process. Feel free to start with the spadework already done here, should you wish, and dig deeper please into revealing our future days. From within these prophetic or predictive pages – composed 500 years ago/since the end of 2011 – I do find that something dark and possibly evil comes. I would add “Most of all beware the green kiss of death and other woeful weapons of world control” although Nostredame foresees that our ‘first-world problems’ in the West such as these will be swept aside by a massive and barbarous onslaught. From the worldly point-of-view and with a watchmaker’s sense of balance we must loosen our restraint by degrees, securing each position held minute-by-minute yet unwinding towards inevitable escape. From a less worldly viewpoint we should know that movement can only bring a degree of discomfiture when we are not yet fully equipped for it. Still this is no mistake. We may find of a sudden that great goodness, previously concealed, will come to meet us ripe from heaven. Constructed for 2012 and beyond, this website and its ‘Watch Out World’ styled partner http://nostradamondo.wordpress.com (opens new window) have been in existence for nearly seven years now and the hundreds of pages and posts uploaded include the extensive II 62 MABUS BY NAME . Mabon is similar to Mabus and a name for the balanced Autumn Equinox (from Latin ‘aequus’, equal, and ‘nox’, night) which swiftly turns to the shortening of days, the reducing of light. In 2017 it also marked the unrequested appearance of advertising on my wordpress websites. At each Solstice, Sol Stitium, the Sun standing still, the Sun will fall below the horizon each evening then rise the following morning exactly where it went down and does this for three days. Like Jonah in the Whale and Jesus in the Tomb? What is real? To a convinced rational materialist the real has tangibility. Funny how many materialists who deny God as a physical impossibility will believe falsely that all smells being sensed are somehow mysteriously insubstantial (so supernatural). March 20th 2019, the Super Moon Equinox has brightened the future. Credibly or incredibly? One way forward may be to look ‘behind and beyond’ appearances and read ‘between the lines’. Otherwise to quieten our intellects and listen to our intuitions. Either way this brings us back to Nostradamus. Despite that a less risk-aversive style of writing has surfaced through the Internet and the world-wide-web yet there is little formula-free writing on the more erudite or professional websites and today even Jazz music performances are mostly ‘rehearsed improvisations’ if the truth be known. While spontaneity is creeping back slowly, I fear researcher-interpreters must still try to obey the old schoolma’am strictures for any Nostradamus website to be taken seriously. And yet naturally-applied intuitions may be a simple key to the understanding of every complexity. Folks had spoken freely for millennia before this Age of Reason’s pedagogues came up with ill-fitting rules and imposed them thru’ the education-and-reward system, now corrupted for a century by false schooling and fake cheerleadings paid-for under the sick agendas of huge wealth Foundations. We have been indoctrinated into accepting a phoney nightmare financed by control freaks. Are these the very ones who have disseminated throughout English-speaking Academe that Nostradamus, the man who saw some monstrous coup d’immiseration coming, is the phoney? Nostredame bows to the uncrowned monarch who knows which way is up – that is if he or she manages to get their time on the world stage. Perhaps it is you? Welcome to Nostradamundus, the World viewed via Nostradamus, with critical new interpretations and hand-selected links. TERMS: In all my writings I refer to The Centuries plus the Preface to Cesar and the Epistle to the King as the ‘Operum Nostradamus’ or else ‘Opera Nostradamus’ (the quatrains scan by their elisions as if intended to be declamed, recited or chanted) or better still ‘Nostradamus’ (because that word has become the discursive title for these dire and originally rather distant revelations that are now pressing upon us). Therefore, to distinguish the man from his works, I always call this prophetic author by his born name ‘Michel de Nostredame’ or some particle of that despite that he fashionably Latinized his surname. I use the title ‘The Centuries’ rather than ‘Les Propheties’ because that is the premier title by which his most important work is known outside of France. Whereas ‘Old French’ is mainly of the North, my own use of the term ‘OF’ in all my Nostradamus writings is intended to mean something more like Originale Fragment de Française, a catch-all phrase for all manner of words used in the South during Michel’s lifetime. TIMES: The loose term ‘Medieval’ refers collectively to all periods of the Middle Ages. Nostredame speaks as much about the past as he does about the future. This need not surprise us. The Sixteenth Century marked a renewal of interest both in ancient history and its effects upon contemporary European life. Further, all astrological methodology and usage depends upon punctual repetitions, timely cycles and a belief in recurrently predictable groups of influences. Given the star-count and mindset of the Celestial Arts-Celestial Sciences, some periods of the past and future must resemble each other to a marked degree. Realistically, history may not repeat itself exactly but the present often rhymes and chimes with a chord or tone of another time. There is some small debate over calendar(s) used by Nostredame, whether the standard Julian or one of the variants available at the time (the ‘Pasques’ ran from Easter to Easter) or even something prototypical of the later Scaligerian. Both the Julian Calendar of the Western Empire and the similar Byzantine Creation Era Calendar of the East were current in Nostredame’s lifetime, and each placed Creation at 5,509-5508 years before the birth of Jesus. 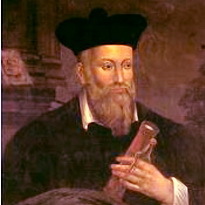 There are some singular and highly debatable points of view being circulated by researchers of the Nostradamus Centuries including that the quatrain verses preserved today are all political inventions from after the lifetime of Nostredame or else that the historic period covered by his disguised clues in the Centuries is the very period concurrent with most of his envisionings, the three decades before 1555. TONGUES: A standard French language was yet to prevail in Michel’s lifetime; he would have known Occitan-Provençau and several related dialects. Occitania today includes a part of the Southern Alpes, the old province of Aquitaine, the Languedoc-Roussillan and modern Limousin. The Occitan dialects – Auvergnat, Gascon, Languedocian, Limousin, Provençal, Alpin Vivaro – are thought to have hardly changed since the Middle Ages, but how can we know for sure? Occitan literature is abundant and long-standing. From the Twelfth to the Fourteenth Century Provençal was the standard language for literature of Southern France and Northernmost Spain, especially for poetry – a tradition started by the troubadours. The even more Spanish structured Gascon used the interpunct diacritic (S·H) as did Old Occitan which could be found interspersed naturally with Latin, suggesting to me some small link to the antique Italic language Oscan. In the South there were very local and specialized languages spoken by mountain dwellers or ghetto groups, such as Judeo-Provençal. Occitan omits k, w and y except in foreign words and the Centuries are light on them also. The letter k appears only once or twice in Nostradamus as a capitalization (Kappa, Kalende) although it appeared before his time in ke (que). The letter w was rarely if ever used. It was normal practice to interchange u with v and i with y or j. By ‘enclisis’ the unstressed forms of ‘le’ were combined in OF with personal pronouns and other elements, mainly je, ne, se, si, que, en. The result was oddities like sil (si le) ses (se les) qel (que le) nes (ne les) nul (ne le) gel (je le) and qil (qui le). Nostredame’s capitalizations do not always seem to be for convention’s sake whilst speech accents appear to be applied intermittently which may reflect the print process or else can suggest an alternative OF meaning, as in the case of ‘apres’ which as the past participle of OF ‘aprendre’ and Occitan ‘apendre’ can mean informed or well-apprehended. Latin and Greek were enjoying a sweeping revival of popularity with the learned class and this accounted for part of the printing-publishing expansion/explosion. Nostradamus Researchers such as Fontenbrune say they can spot that Nostredame was processing thoughts in Latin before writing them down in proto-French. (Meaning that Nostredame had intended and expected the full meaning of the Latin originals to be grasped by his readers? Surely not.) The emergent notion of intellectual property rights was slender and surely counter-culture at some point. Master printers were educated men perhaps the equal of their authors and some thought little of altering a text to their tastes or persuasions. Jacks of the trade had only rudimentary experience of foreign words and no common idea of fixed spellings. Physical print errors commonly occurred, changing words unintentionally. A testing time to opt for composing what looks at first sight to be a fickle form of the genus gobbledygook intended to be deciphered way off in the future! Linguistics form the biggest block to the grasping of Nostradamus solely by logic (if such a route exists). Modern French does not relate directly to the hundreds of dialects and languages found in archaic proto-French and has all the usual pitfalls of translation. Best we translate direct from OF to English and try to ignore Modern Fr. as a French-speaking researcher will always feel certain that they recognize what certain words and phrases mean when investigation could prove them wrong. Then there is also the dog-carp of Latin-over-Greek whilst Old French’s neighbouring mut, Middle English, produced their stray pup ‘faus francais d’Angleterre’ and that may all have crept through gaps. Michel’s tight linguistic mix does, however, stimulate intuition very very well, as stirred by Nostredame the chef d’verbe. TEMPLATE: In Western astrology the latitude of a celestial body doesn’t count for much and the real-time position of a star or constellation is not of overwhelming importance. Above and below the ecliptic plane is reserved for speaking of Astrological Ages. The operative section is the ecliptic plane or Longitude and where along this the heavenly bodies shall appear. Hororary (Q+A) Electional (best time to do a thing) Natal (birthchart) and Judicial/Mundane (events) Astrology became a distinct branch that fell out of ideological favour under a Church discipline that had even demanded the Earth to be central to the Universe despite prior proofs to the contrary by ancient astrologers. In the Renaissance these became almost an undercover type of astrology as opposed to natural astrology taught and used for health horoscopy (‘weals and woes’) and medium or long-range weather forecasting by the positions of planets such as in the periodic Almanacks. In Astrology a planet is ‘combust’ more or less when it is conjoined with the Sun within a few degrees and becomes ‘occulted’ or hidden, restricting its imbued influences over you and I. Nostredame had his own variation on this term, being when a planet and the Caput Draconis were apparent in the same Sign. During the Age of Taurus, Alpha Draconis was the Pole Star. In Medieval Astrology the planetary alignments were either malefic or benign, without any in-between states nor any needle-tip alignment where the feared portent might just flip into a happy outcome. Despite that Michel’s divination practices were easy to condemn he was not without his equivalent in the Church. One influential Medeval astrologer had been made a Cardinal. The NT (2 Peter 1:19-21) observes that all succesful prophesying flows through the Prophet yet has its source in the Holy Spirit. TENOR: The universe of discourse was different back in the Sixteenth Century. For sure life was not seen nihilistically as a ‘thing’ – some reasoned aggregation of scientifically acceptable categories of evolution – but more immediately with full awareness of a plentiful vivacity frequently vented by fate and its fatalities and the spiritual dimension streaming through the whole. TRANSLATION: On the quatrains I sometimes offer alternative translations to those supporting my main thrust because I do not feel that I nor anybody is the very last word on Nostradamus. The person who Michel foresaw would understand them best may be around now, I think, but has yet to surface visibly. My thinking on the epistles may seem somewhat alien at first and at times my translation may read like a man trying to herd cats but that is because the originals are each exactly like that; not always sensible on the surface and once or twice resembling a random cut-up with phrases pounced out of their proper place. There have been many hundreds of translations of these texts. Please understand that I have seen my translator’s role in a broad way and have not shrunk from taking up a position at variance to the bulk of the literature simply because all the vital truth contained within Nostradamus is not yet out. Perhaps you are the one who eventually will see it all clearly, or see the world more clearly through it, as Michel de Nostredame foresaw nearly five hundred years ago.